Lake Bracciano (Lago di Bracciano) is a lake in the Italian region of Lazio, 32 km northwest of Rome. It has a perimeter of approximately 32 km. Three towns border the lake, Bracciano, Anguillara Sabazia and Trevignano Romano. The lake is a popular location for Romans at weekends, particularly during the summer when the area can get extremely crowded. It serves as a drinking water reservoir for Rome and the use of motorboats is forbidden. This makes Bracciano one of the cleanest lakes of Italy. Swimming, sailing and other watersports are permitted. The towns of Anguillara and Bracciano can be reached by train from Ostiense railway station in Rome. By car, take Rome’s ring road (the GRA) to the Cassia bis exit and follow the signs to the lake. 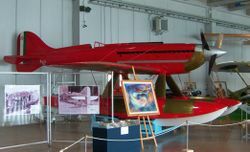 Alternatively, you can take the coastal Autostrada in the direction of Civitavecchia, leaving it at Cerveteri and following signs to Bracciano. 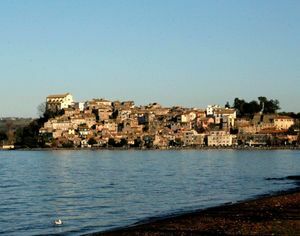 Anguillara Sabazia is built on a small cape that sticks out into the lake. Three kilometres east of the town lies the small Lake Martignano. This is not accessible by car and requires a short walk from the parking area. Unlike Lake Bracciano it is very undeveloped. Trevignano Romano is on the north side of the lake. It has some pleasant lakeside walks and is the lake’s main sailing center. Albergo Borgo Vistalago - Via Garbaldi, 61 - 00169 Trevignano Romano (RM), Italy  Telepone + 39 06 9997701 • Fax +39 06 33973586. Boutique hotel located in the picturesque town of Trevignano Romano on the shores of Lake Bracciano with a large choice of bedrooms and suites with private bath, shower or bathtub, satellite TV and much more. The Wi-Fi connection is available in the common areas. Standard room: 78 euros with breakfast included. The Etruscan tombs of Cerveteri are just 20 minutes from Bracciano to the southwest. Closer, but along a winding road to the northeast, leaving the lake at Trevignano, is Sutri, which has an interesting Roman amphitheatre carved out of rock. This page was last edited on 9 July 2017, at 21:52.